Active isolated stretching can help you, After a ride on your bike, have you experienced numbness, tingling, or pain in your arm, hand, wrist, or little finger? If you have, you could be suffering from an overuse injury. Approximately one-third of all bicycling overuse injuries involves the hands. With the other two third portion being hips, knees, ankles, neck and shoulders. The 2 most common are what we call “handlebar palsy” and carpal tunnel syndrome. By making some adjustments to your bike and by wearing some protective equipment, you can prevent these injuries from occurring. 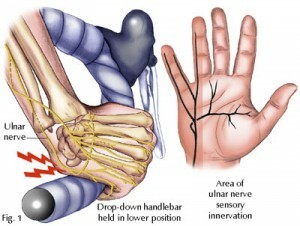 Ulnar neuropathy, known to cyclists as handlebar palsy, is caused by compression of the ulnar nerve at the hand and wrist. The ulnar nerve controls sensation in your ring and little finger and controls most of the muscular function of your hand. Compression of the ulnar nerve is a common problem for competitive and recreational cycle enthusiasts, alike. Compression is the result of direct pressure on the ulnar nerve from the grip on the handlebars. Often, the nerve may be over stretched or hyperextended (extension beyond its normal limit) when a drop-down handlebar is held in the lower position. The pressure placed on the ulnar nerve results in numbness and tingling in the ring and little fingers or hand weakness, or a combination of both. Symptoms can take from several days to months to resolve, but surgical treatment is rarely necessary. Rest, stretching exercises, and anti-inflammatory medications, such as aspirin, usually help relieve the symptoms. Applying less pressure or weight to the handlebars and avoiding hyperextension can help to prevent a recurrence. 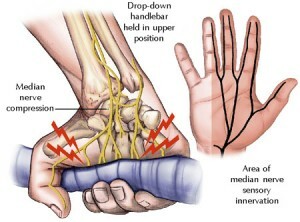 Although it is less common than handlebar palsy, carpal tunnel syndrome (compression of the median nerve at the wrist) is another overuse injury that cyclists often experience. Injury often occurs when a cyclist holds the handlebars on top and applies pressure directly on the median nerve. Symptoms include numbness and tingling in the thumb, index, middle, and ring fingers and weakness of the hand. Symptoms usually resolve quickly once you stop cycling for a short period of time. Although handlebar pressure contributes to these symptoms, there can be other causes for hand pain and numbness; therefore, an evaluation for other possible causes of carpal tunnel syndrome should be performed by your health-care professional. You can overcome or prevent overuse injuries altogether by making some adjustment to your equipment and behavior. Adjusting the handlebars, the seat, and the pedals to your fit is the key to preventing most overuse injuries. Adjust the bike so you sit in a more upright position, taking the weight and pressure off your hands and wrists. Take a rest during long rides and change your hand position on the handlebars often. Shift your weight from the center of your palms to the outside edge of your palms as often as possible. Wear padded gloves and add handlebar padding to your bike to help protect your hands from injury. The padding absorbs the shocks and jolts from the road, limiting the stress transmitted to your hands. Your hands will also be able to handle the stress from the roads much better if you complete a short session of hand and wrist stretches before hitting the road. Most often, overuse injuries experienced by cyclists stem from a lack of specific preparation. With the proper training and equipment, you can minimize the risk of these hand injuries. Remember to never hold a stretch for longer than 2 seconds! 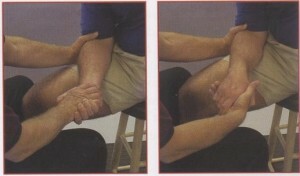 and always work through full range of motion with your wrists when performing these exercises. Wrist extension will stretch your flexor muscles of the forearm , contract the muscles on the top of you forearm and the therapist will gently stretch the muscle and tendon attachments of your wrist and forearm. Rotation helps to loosen those entrapped nerves, contract the muscles for internal rotation, and let the therapist stretch your external rotational muscles, and after that you’ll stretch the internal rotational muscles by doing external rotation.